Are you thinking of installing photovoltaic (PV) solar panels to save your company or organization money? You've got three basic choices when choosing a commercial solar system: ground-mounted solar, a rooftop solar system, or a solar carport. Currently solar carports are becoming a popular option for businesses, schools and other organizations because they offer a number of other benefits in addition to generating clean energy. In many ways, carports are a highly versatile solar solution, as BuildingGreen.com recognized recently. The website, which produces an annual list of the most exciting innovations in health and environmental products, selected SunPower’s carport solutions as one of its Top 10 recommended products of 2018. They leverage underused spaces. A solar carport can turn a blandly functional parking space into something that generates both clean energy and monetary savings while also visibly demonstrating your commitment to sustainability. When solar panels are put on a roof or installed at a distant location, they're often out of sight. But solar carports are right there where visitors and employees can see them. If you wish, solar carports can be designed to channel storm water for reuse, making your operations more sustainable in an unexpected way. Carports can be configured to offer electric vehicle charging stations. EVs are soaring in popularity, so this answers a growing need for many businesses. SunPower has installed solar carports for a number of high-profile businesses and organizations. Just this year, Toyota Motor North America finished installing a mammoth 8.79-megawatt SunPower solar system at its new 100-acre headquarters in Plano, Texas. It spans four parking garages, making it Texas' largest corporate office on-site solar installation (not including utility companies). This project helped Toyota achieve its goal of LEED Platinum status. Carports are, of course, a great fit for businesses in the business of selling cars, so we’re seeing a surge in the number of auto dealerships going solar. 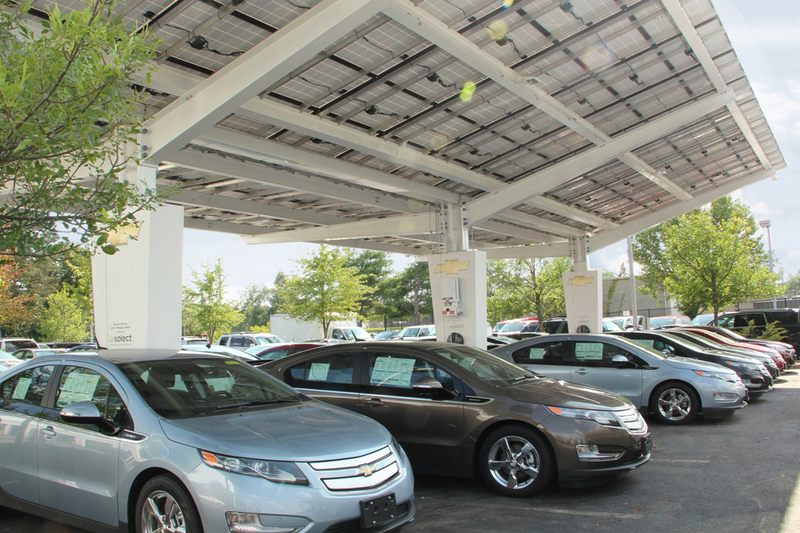 Auto dealership owners are saving money on electricity by installing solar carports and/or solar rooftop systems. For example, Luther Auto Group, the largest privately owned automotive group in the Midwest, decided to make a dent in its electric bill by partnering with SunPower to install high-efficiency SunPower® solar systems on 10 of its 33 dealerships, adding about 454 kilowatts of solar. Educational institutions are also choosing solar carports for clean energy and to save money on their electricity bills. Such installations work well for schools, which typically have large parking lots for commuting students and faculty members. Earlier this year, the University of California, Merced, installed a 5-megawatt SunPower system featuring a combination carport-and-rooftop system, complemented by a 500-kilowatt energy storage system. UC Merced already had a 1-megawatt ground-mounted solar tracker system that has been beating performance expectations since 2009. The two systems together are expected to meet more than 50 percent of the campus' energy needs. But it's not just for colleges. Mount Diablo Unified School District, one of the largest in California, turned to solar as a way to offset budget cuts that threatened to cripple academic programs. In 2012, Mount Diablo USD installed solar panels on parking structures and rooftops at 51 sites across the district, making it the largest K-12 solar project in the country at the time. Mount Diablo's solar systems have the capacity to generate 12.1 megawatts, cutting the district's electricity bill by 92 percent in the first year and reducing electricity costs by more than $3 million annually. In all, the system is expected to save Mount Diablo about $220 million over 30 years. For organizations looking to build a solar carport structure, SunPower is the only company in North America that can do it all. In the past, a solar carport customer had to buy solar panels from one company, the steel structure from another and have everything installed by another company. SunPower takes care of everything from the ground up. For instance, SunPower led the innovative design of Toyota's project. Carports can be more complex to build than either ground or rooftop systems, and the designs can vary based on geography. For instance, the dual-tilt solar carport design is best for colder climates because it naturally directs the flow of snow and ice to the middle of the canopy and away from the cars below. Watch this short video to learn more about how solar carports work. It’s also worth noting that the cost of a solar carport is dropping. And the price is expected to continue to decrease as labor costs improve. There are new incentives offered by states to help make solar carports more attractive. California has long encouraged solar carports for commercial spaces. Now Massachusetts' SMART program is expected to do the same because, unlike ground solar units, carports conserve scarce land in densely populated areas. Solar carports also make sense in sunny places like Texas and New Mexico, where employees and visitors alike compete for shaded parking spaces on hot days. SunPower has architects and designers on staff who can help with any type of solar canopy design. Contact us so we can engineer a more sustainable place to park your car. 1 A typical project assumes core and shell of major renovation with at least 10% of the energy offset by solar, sufficient products to qualify for Material and Resource categories, and 33% of the hardscape covered with solar, or other heat island reducing coverings.